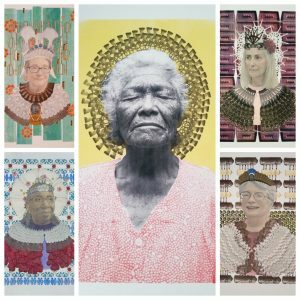 FSU Adjunct Professor of Printmaking and Print Lab Manager Amy Fleming is opening a solo exhibition, “The Aesthetics of Elderhood: Artworks on Ageism,” at the Tallahassee City Hall Galleries, produced by the Council on Culture & Arts (COCA). The exhibition focuses on the similarities between our cultural regard for the elderly and that of consumer culture. A free, public reception for the exhibition begins at 6:00pm on Friday, Feb. 8 in the City Hall Gallery, and lasts until 7:30. The exhibition is open from January 30th – April 15th. This is one of a dozen exhibitions curated by COCA and is part of the City of Tallahassee’s Art in Public Places program. For more information about this exhibition, upcoming exhibitions, or the Art in Public Places program, contact Amanda Karioth Thompson (Amanda@tallahasseearts.org) at COCA, (850) 224-2500. “Ageism has been described as one of the most institutionalized forms of prejudice and it directly affects the wellbeing of those it targets. It is also the only form of discrimination we will all face if only we live long enough. Parallels can be found in hyper-consumerism where the old is discarded to make room for the new. Fleming’s artwork prominently features portraits of mature women, most of them regulars at the City of Tallahassee Senior Center. Using images of mass produced, discarded objects, Fleming creates royal robes and crowns for each elder citizen. They smile in the foreground, appearing as iconic as a saint, and are haloed by radiator hoses and hairspray bottles.